Changes in body odor can be mortifying for all women who experience them. While sweating is normal to cool the body down, some women may find themselves with increased sweating or an unpleasant change in body odor that they cannot get rid of in the usual way. For women of reproductive age the most likely cause of this disorder is hormonal imbalance, and it can present itself at different times of a woman's reproductive life. 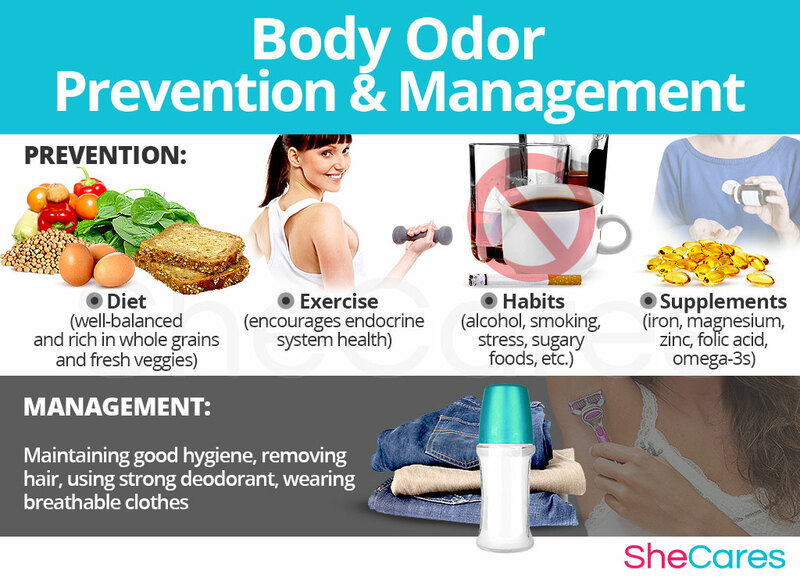 It is possible to manage changes in body odor in all stages of life. In order to learn everything about body odor, including its causes, triggers, signs and symptoms, and treatment options, please continue reading. Body odor is unique to each individual and is affected by food, habits, and environmental factors. According to one study, women's body odor smells like onions, while men's smells more like cheese. Women are more sensitive to body odor smells than men. The term “body odor” (or B.O.) relates to the unpleasant smell that can emanate from the body when a person sweats. Sweating is a normal and essential bodily function that helps regulate body temperature, and it is released by eccrine glands and apocrine glands. Sweat secreted by eccrine glands is odorless and serves to cool down the body, whereas apocrine glands release a greasier secretion through hair follicles in areas like the armpits, groin, and scalp. Body odor is produced when bacteria starts breaking down apocrine sweat; thus, an unusually high production of apocrine sweat makes body odor more intense. The production of apocrine sweat in women is more pronounced when hormonal fluctuations are taking place. Although this occurs naturally during a woman's menstrual cycle, many women suffer from accentuated hormonal changes, known as premenstrual syndrome or PMS. In this case, as well as during phases of significant hormonal changes such as puberty, pregnancy, post-partum - including breastfeeding - and menopause, changes in body odor are more likely to occur. The odor produced by sweat can be a great indicator of a woman's overall health. When a woman is healthy and her body is in harmony, she can expect to experience normal body odor. However, changes in body odor can be linked to imbalance in the body, whether through imbalanced hormones, diet, or other illness. While the individual experience of persistent body odor is different from woman to woman, this disorder can mainly be classified according to its intensity and the type of smell that is being produced. Continue reading to learn about all the hormonal and other causes of body odor, in order to gain a greater understanding of this condition. To be able to treat body odor, first it is important to learn about the causes of this troublesome disorder. Although there could be many contributing factors, for women hormonal changes are a common and likely cause of the disorder, and should be considered first, before accepting other factors and medical conditions as a cause of changes in body odor. 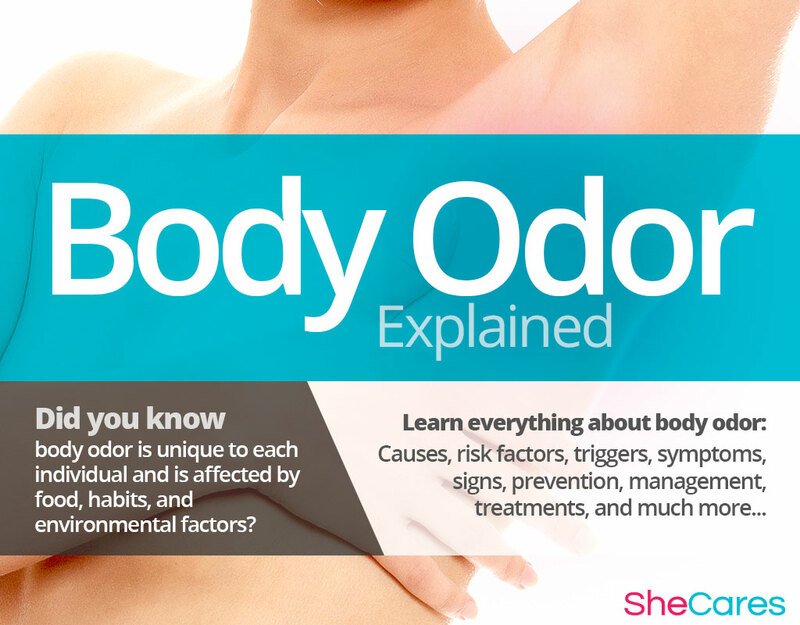 Continue reading to learn more about both the hormonal, and other, causes of body odor. Hormones are chemical messengers that control all processes in the body. When fluctuations of hormones such as estrogen and progesterone occur, cells and organs don't receive the correct signals to be able to function adequately, which can lead to hormonal disorders. Medical researchers have found that fluctuating levels of hormones, especially estrogen, affect a woman's sensitivity to heat, causing symptoms such as hot flashes and causing the body to sweat more often and more profusely. Estrogen deficiency during in the menstrual cycle and during phases of significant hormonal imbalance - puberty, pregnancy, post-partum, and menopause - causes the body to overheat and produce extra sweat. This in turn can lead to an increased incidence of more noticeable body odor during these transitional phases. In this sense, we can say that changes in body odor are largely caused by the hormonal fluctuations during the changes women go through during reproductive life. There are also other hormonal causes and typical environmental factors - which may explain body odor problems - specific to the stage of a woman's reproductive life in which this disorder appears, such as around PMS and during puberty, pregnancy, post-partum, and menopause. Puberty is the stage in which a girl's body begins to produce reproductive hormones; these and other factors, such as body hair and life worries, contribute to body odor during puberty. Pregnancy leads to extreme changes in the production of reproductive hormones, which along with other factors, like raised body temperature due to physiological changes, can lead to increased body odor. Post-partum and breastfeeding is another stage where reproductive hormones are imbalanced, leading to symptoms like body odor. Other factors which contribute to body odor in post-partum include excess sweating caused by body changes. Menopause is the stage in a woman's life when production of reproductive hormones naturally declines, signaling the end of a woman's fertility. As well as hormonal causes, other factors add to the reasons for body odor during menopause, including the experience of other symptoms of menopause. 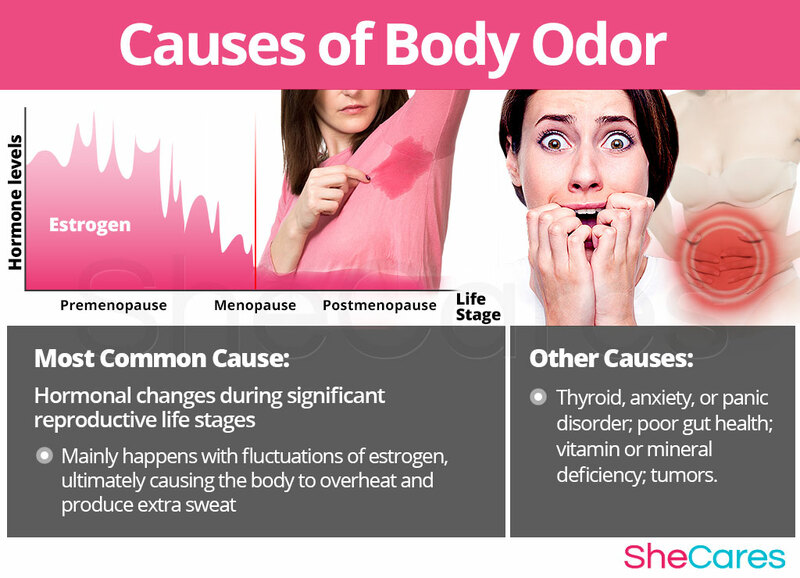 For women experiencing body odor, hormonal imbalance is the most likely cause. However, there are other, less common conditions that may be affecting body temperature or sweat glands, leading to increased sweating and body odor. These include thyroid disorder, diabetes, or even tumors. Keep reading to learn about the risk factors for excessive body odor. The possibility of developing body odor is can be higher for women who have certain health risk factors, like diabetes or a sweating condition called hyperhydrosis. When these risk factors are present, body odor is more likely to occur, especially during phases of hormonal change during reproductive life. In addition to long-term risk factors, there are more immediate triggers that may cause a woman to start experiencing more noticeable body odor. These consist of immediate environmental factors and behaviors, such as eating spicy foods or extreme changes in body temperature. Continue reading to learn about the signs and symptoms of body odor, and how a doctor can recognize and diagnose this condition. Women suffering from symptoms of hormonal imbalance can experience very different symptoms that will depend on the exact hormone that went off. Some women experience mild symptoms of body odor infrequently, while others have severe symptoms almost daily. However, most women are able to recognize that their own scent is changing and feel uncomfortable or ashamed because of it. For other women, it may be more difficult to notice it themselves. Some women may feel that their body odor can be so strong and so disruptive that they require medical attention. To diagnose and identify these symptoms, the doctor usually must perform a review of the patient's medical history and then a physical exam. In some cases, if necessary, the doctor may also order some tests. If left untreated, it is unlikely that a woman will experience any worse physical symptoms, unless the body odor is caused or exacerbated by a lack of personal hygiene. Instead, many of the complications are psychological or social; women may suffer from low self-esteem, anxiety, feelings of depression, and it may begin to affect her personal, social, and professional life. Many women become overly aware of their body odor, and may isolate themselves from social situations or avoid physical activity, further knocking their confidence. Continue reading to learn some techniques and habits that can help prevent body odor, or manage the condition. Many of the aforementioned foods that should be avoided, have a pungent smell that will linger on your clothes. For this reason, if you do consume them it is advisable to wash your clothing afterwards, as well as showering or bathing yourself. If clothes are not washed the scent is likely to worsen over time. There is no medical way to prevent body odor; instead, a combination of healthy lifestyle changes will lessen the chances of experiencing body odor, or reduce its intensity. These include changes to diet and exercise habits, and developing other healthy habits, which can be complemented by the use of supplements to boost the endocrine system, and reduce symptoms of hormonal imbalance. For women who are already experiencing problems with body odor, learning some ways to manage the problem will help to lessen its severity. Keep reading for some body odor management tips. Thankfully, women who experience body odor because of hormonal reasons have several ways to manage the problem in order to reduce its frequency and severity. Making minor daily changes and avoiding triggers can make a huge difference to the experience of body odor problems. Other possible management options include alternative treatments such as acupuncture or biofeedback. Although these treatments do not tackle the hormonal cause behind body odor, they can be effective in improving the experience of sweating or body odor in the short or medium term. While these measures often help reduce the incidence of body odor, they are unable to get to the root of the problem, which is most commonly hormonal imbalance. Fortunately, there are several treatment options available for women suffering from body odor issues. Read on to learn more about treating body odor. There are other dietary considerations which can successfully alleviate body odor in some women. Garlic, onion, spices, and alcohol can all exasperate the problem in some, however, these are not likely to affect all people in the same way. Try cutting each one out at a time to see if it makes a difference. At some point during reproductive life, it will be inevitable for some women to experience problems with body odor. Fortunately, because body odor is also a consequence of fluctuations in hormones such as estrogen, testosterone, and progesterone, it is possible to find an effective treatment. Three levels of approaches can be considered for treating body odor. These are categorized as: (1) Lifestyle Changes, (2) Alternative Medicine, and (3) Pharmaceutical and Surgical Options. It is recommended that a woman begin with the least risky option, lifestyle changes, before progressing to the next stage of treatment only if necessary. For most women, body odor issues can be dealt with through low-risk lifestyle changes and supplements; however, pharmaceutical and surgical options are available in extreme cases, although it is recommended that a woman assesses the associated risks before committing to such a treatment. This primary level of treatment is the least risky approach, although it requires self discipline. Often simple changes in lifestyle can reap huge benefits in fighting body odor, and achieving a higher overall level of health. Fundamentally, an improved diet, regular exercise, and healthy habits can do a woman great service. Like multivitamins, alternative medicines and supplements involve little to no risk and can be an extremely effective way to treat body odor. In the case of herbal supplements, there are two main types that can be used: phytoestrogenic and hormone-regulating herbal supplements. These supplements, such as black cohosh, contain estrogenic components produced by plants that complement the low estrogen hormones in a woman's body, helping alleviate body odor. By introducing plant-based estrogens into the body, these herbs treat the underlying estrogen deficiency causing body odor issues. They are mainly effective for menopausal women who are more likely to have low estrogen levels but are not necessarily effective for women in other stages of life such as puberty. These supplements, including Macafem stimulate the body's natural hormone production by nourishing the pituitary and endocrine glands, helping the whole hormonal system produce hormones more efficiently. This ultimately results in balancing not only estrogen but other important hormones such as progesterone. These supplements can be considered the safest and most natural way to treat the underlying hormonal imbalance causing body odor, and can be taken throughout a woman's life, as they support the body's natural hormone production. Other supplements that can dispel body odor, or at least reduce its severity, include vitamins and other herbal supplements. For most women, lifestyle changes, especially changes in diet and more attentive personal hygiene, combined with herbal supplements often improve overall health to the extent that body odor is no longer an issue. However, sometimes body odor is a more stubborn problem, caused by a more serious underlying health or hormonal disorder. In these cases, women might decide to seek a more drastic treatment option. Interventions for treating body odor and excessive sweating at this third level involve the highest risks and side effects, as well as the highest costs. It is strongly recommended to speak to a licensed healthcare practitioner before starting any pharmaceutical treatments for body odor, especially because not all treatments are suitable for women at every life stage. Treatments for body odor can include pharmaceutical options such as hormone-regulating medication, and surgical options. These three approaches to menopause treatment are not mutually exclusive. A woman may use any combination of these treatments to combat body odor issues, depending on her experience of this disorder. 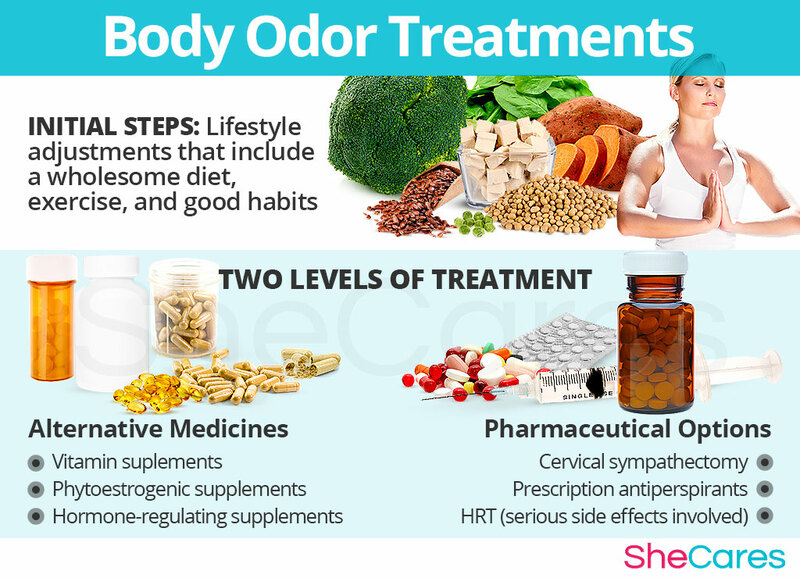 Many women are discovering that their body odor, along with other symptoms of hormonal imbalance, can be managed and treated with a combination of lifestyle changes and herbal medicine. The best initial approach to balance hormones is to go natural, contemplating having a good lifestyle from exercise, nutrition and complementing with alternative options to balance hormones. Read more about them.